A US arms manufacturer supplied lethal weapons to Ukraine for about a year before Washington’s formal approval, the company’s CEO revealed to Voice of America (VOA). The US Congress approved the sending of “defensive” lethal weapons to Kiev only in November. Texas-based company AirTronic USA has been selling grenade launchers to the Ukrainian Armed Forces, VOA said in its report, citing the company CEO Richard Vandiver. The company head told the media outlet that his firm began cooperating with Kiev as early as two years ago while the first arms deliveries were made in 2016. “We started to deliver our goods to Ukraine last year [and] we continue to deliver them up to this day,” Vandiver said. He refused to provide any further details concerning the contract but said that the US embassy in Kiev, as well as the State Department and the Pentagon, closely monitor the issue. The businessman also added that his company obtained an official export license for its weapons from the State Department. The supply agreement was initially renewed annually but is now not limited by time, Vandiver said, claiming that the US embassy now controls how the grenade launchers are used by Ukrainian troops. The contract specifically prohibits resale of the weapons. In the meantime, Vandiver said that the weapons his company supplies to Ukraine are purely of a “defensive” nature and thus do not violate any international agreements – even the Minsk Accords. However, he did acknowledge that it is a “lethal weapons system,” adding that the grenade launchers have a maximum range of 1,000 meters. The news comes just two weeks after the US Congress approved the draft of the national defense budget that authorizes $350 million to provide security aid to Ukraine to “provide security assistance … including defensive lethal assistance.” The 2018 National Defense Authorization Act (NDAA) also contains an entire category entitled ‘Countering Russian Aggression’. 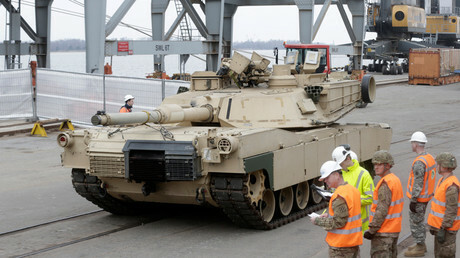 Under this category, the US plans to spend as much as $4.6 billion on what it calls the European Deterrence Initiative (EDI) aimed at “reassuring NATO allies and enhancing the US deterrent and defense postures in Europe.” In particular, the NDAA envisages allocations of $100 million in military aid to the Baltic countries. Russia has repeatedly criticized the US plans to send lethal weapons to Kiev, calling them a potential threat to stability in Ukraine, as well as neighboring countries. In particular, Moscow warned that the move could encourage Kiev to renew a full-out war in Donbass in an attempt to resolve the crisis in eastern Ukraine.